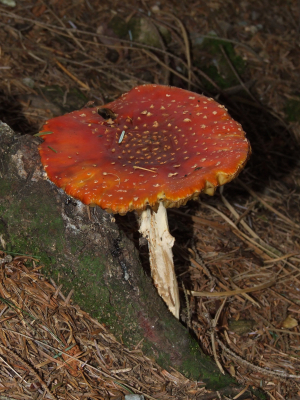 Observation - Amanita muscaria - UK and Ireland. Description: Cap depressed with age, red with white scales. Gills creamy white, crowded and free. Stipe white with ring. Cap depressed with age, red with white scales. Gills creamy white, crowded and free. Stipe white with ring.